As I leave Brazil its time to reflect on the four weeks I've had in the country enjoying the people, the culture and the biggest sporting event in the world. Forget telling your mates to turn up to your house with a few snags and hamburgers, the Brazilians have thing thing down to a fine art. Hiring a specialty barbecue chef for the party, they'll have food coming off the grill all day long ranging from all kinds of skewered meats, including a few (like chicken hearts) that are a little odd. If you're ever in Brazil and get invited to a barbecue make it your first priority. No, really cold. They don't even seem to care what kind of beer it is (mostly really light lagers) but if its not virtually frozen they'll send it back. It'll usually come served to the table in a large bottle with its own cooler, which you then pour into tiny glasses so as to keep it cold as long as possible. I can only imagine what they must thing when they go to the UK. This has to be a bit of a no brainer, but with five goals in three tournaments now - along with countless other heroics while wearing the green and gold - he has given his best performances when on national team duty. Hopefully he goes on to play for us for a few more years yet, but whatever the case, he's certainly proved his credentials to be regarded as the best ever. 4. Brazilian people are crazy friendly. 5. Travelling Aussies are as bad as ever. Yeah I know I'm one and probably no exception, but it has to be said, the only negative experiences I had in four weeks of Brazil during the World Cup were caused by Aussies. I'm not in the "avoid other Aussies at all cost" camp of travellers, but nor am I in the "Australia is the greatest country on earth" cheer squad (usually spouted by people who've been to very few other countries). Generally it was a combination of booze and boys hanging out in large groups thinking they could do or say anything in a developing country, but it was truly disappointing to see so many of these guys representing my country. That isn't to say that is representative of the Aussie fans in Brazil as a whole. Far from it. The overwhelming majority of my country men and women I encountered were doing us proud, it is just a shame when a few bad eggs spoil it for everyone. While the prospects of me going to Russia or Qatar are pretty slim, I'd like to think I'll get to another World Cup sometime in the future. Ideally, I'd love Australia to be able to host so that I could attempt to be as good of a host as so many of the Brazilians have been (difficult job!) and with any luck, something happens with the 2022 World Cup. Arriving in Cuiaba ahead of the first game one thing was perfectly clear - the Chileans had much better chants, cheers and songs to sing for their team. Never mind the fact they had us outnumbered about three to one. I'm not sure what it is with Australian sports fans, but we've never really been much for the singing and chanting, and when we get to a big stage like this it becomes obvious. I'm sending out a challenge to anybody with more creative and musical ability than me (really low bar) to rectify this for the next world cup. We've got four years to think of some chants or songs, or even re working some Aussie classics so that they work in the football song environment. I'm thinking someone can do something with the Hunters & Collectors classic Holy Grail or John Farnhams, You're the Voice. I'm setting you this challenge Australia! Ok, admittedly I knew the latter already, but Brazilians really like to hit the dance floor. Whether it's samba or some cheesy "country" song with its own dedicated dance routine, you cannot stop a Brazilian from getting out there and shaking it. More so than any other country in the region, Brazil has such a wide mix of cultures, backgrounds and ethnicities that literally (and I'm using this word properly) can look pass for being Brazilian. Part of what makes Brazil such a great place to visit is the diversity of backgrounds and the completely different feel from one city to the next. Walking down the street its virtually impossible to pick who is Brazilian and who is a foreigner - even for the locals. That is, of course, until we open our mouths. While Portuguese may look on paper, a lot like Spanish, when it is spoken it sounds more like Russian. My feeble attempts at speaking the local language made it instantly clear to anyone I was talking to that I was a foreigner. Which wasn't necessarily a bad thing. 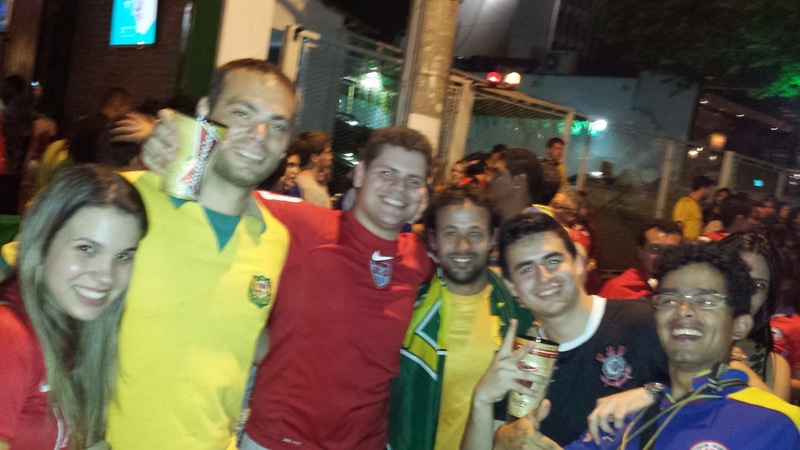 I loved my four weeks in Brazil, but it just wasn't enough. You could easily spend that time just in Rio and still feel there was more to see. Brazil is a very big country and there are so many other cities, like Recife, Salvador, Brasilia and Manaus that I didn't get a chance to see. If these places, and others are as diverse and interesting as the cities I did get to visit, coming back to the country that has treated me so well is merely a matter of when, not if. While I'll be in no position financially to commit to any travel in the forseable future, with Rio hosting the 2016 Olympic Games, it would seem like the perfect opportunity to combine another Long Road to Rio with seeing more of this beautiful country.